Before new employees start, managers need to prepare for their arrival. This checklist ensures you're ready—even before day one. So much effort goes into finding the best candidate that when you actually find them, you sometimes have to scramble to prepare for their arrival. Depending on which team you lead, that process might look different, causing inconsistent onboarding experiences across your company. 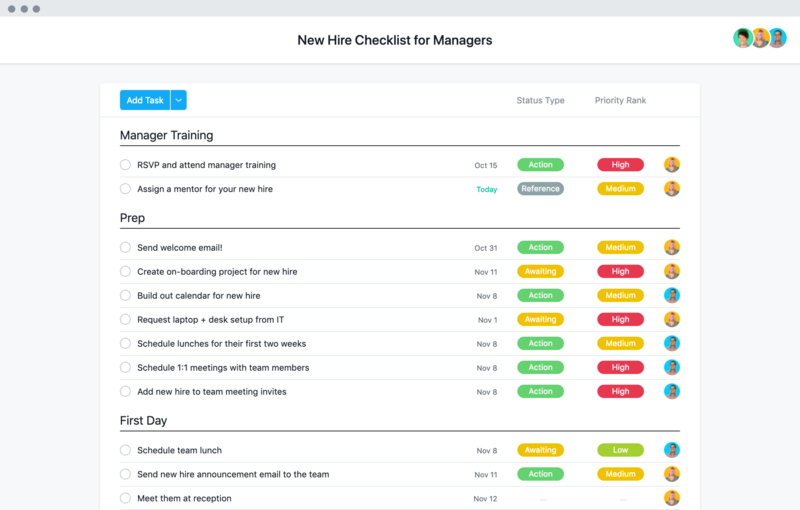 Our new hire checklist template helps managers standardize and speed up the onboarding process so new hires can start making an impact in their role with confidence, faster. Standardize your onboarding process. Give all managers a consistent plan to make sure new hires have what they need to succeed. Any team can start with our template and further customize it to their needs. Collaborate with cross-functional teammates. Onboarding a new hire usually involves working across several departments to ensure everything is in place. Keep track of responsibilities and timelines by assigning tasks with due dates. With Asana templates, you can create an effective onboarding process for managers—ultimately leading to the best experience for both you and your new teammate. Standardize onboarding with Asana Premium templates so new hires can hit the ground running and you can support them from day one.